Kenji Yamamoto is Professor of the Research Institute for Bioresources and Biotechnology, Ishikawa Prefectural University, and Emeritus Professor of Kyoto University. He obtained his Ph.D. from the Faculty of Agriculture, Kyoto University, in 1979 for studies on the biosynthesis of aminosugar nucleotides in microorganisms. Dr. Yamamoto started his professional career in 1976 as a research associate in the Department of Food Science and Technology, Faculty of Agriculture, Kyoto University, and was promoted to associate professor in 1991. In 1999, he became Professor of the Graduate School of Biostudies, Kyoto University. In 2010 he retired from Kyoto University and took up his present position. His research focuses on production and application of microbial enzymes related to biosynthesis and catabolism of sugar chains in glycoconjugates and oligosaccharides. He was awarded the Japan Society for Bioscience, Biotechnology, and Agrochemistry Award for Senior Scientists in 2011. Rapid progress in gene and protein engineering has enabled important advances in the development of new medicines and treatment of various diseases. However, the technique of adding sugar chains to proteins has not yet been fully developed despite the fact that it is important in protein synthesis as a post-translation process in the cell. So far, no effective techniques or tools to freely engineer the sugar chain have been established. Since the biosynthesis of sugar chain occurs in Golgi and endoplasmic reticulum (ER) inside the cell with the participation of many enzymes, it is very difficult to control the biosynthesis processes involved in the addition of a particular sugar chain to a protein or the modification of the sugar chain itself. The engineering techniques required seem beyond reach. The author and his coworkers focused on microbial endoglycosidase as a useful tool of glycotechnology because it is similar to the restriction enzyme endonuclease that can freely cut off and attach genes in genetic engineering. We applied endoglycosidase as a practical tool and attempted to establish chemo-enzymatic synthesis of various medicines including biomedicines by the ability of endoglycosidase to delete, attach and modify the sugar chain. Here, we describe the various results of studies on the synthesis of glyco-medicines by using endoglycosidase (endo-β-N-acetylglucosaminidase) from fungus of Mucor hiemalis isolated from soil and identified1. The development of efficient synthesis utilizing the special characteristics of endoglycosidase is also discussed2. It is well known that microorganisms produce many glycosidases. There are two types of glycosidases: exoglycosidase, which can liberate monosaccharide moieties from carbohydrate compounds, and endoglycosidase, which can release oligosaccharides from them. The former can hydrolyze monosaccharide from oligosaccharides and sugar chain of glycoconjugates, and the latter can liberate oligosaccharides by recognizing the inside structure of the sugar chain. Endo-β-N-acetylglucosaminidase, which is the best known endoglycosidase acting on glycoconjugates, hydrolytically cleaves the N, N’-diacetylchitobiose moiety (two N-acetylglucosamines are bound by the β1-4 linkage) in the core region of asparagine-linked oligosaccharides of glycoproteins, and releases oligosaccharides3. The enzyme shows a unique action to leave one N-acetylglucosamine (GlcNAc) moiety bound to the protein. This enzyme is widely found in various plants and animals, and the microbial enzymes have been thoroughly studied with their specificities and functions elucidated. Recently this enzyme has been reported to be a key enzyme for ERAD (endoplasmic reticulum associated degradation) involved in quality control of protein in ER4. We have found a unique endo-β-N-acetylglucosaminidase having specific substrate specificity from the culture broth of a fungus isolated from soil in a suburb of the city of Kyoto and identified as Mucor hiemalis5. This enzyme was named Endo-M after its source. Endo-M was found to have transglycosylation activity in addition to hydrolyzing activity,6 the same as many other exoglycosidases. Transglycosylation by glycosidases is considered to be a special type of hydrolysis. In hydrolysis by glycosidases the carbohydrate moiety of the substrate is assumed to be released and transferred to water. On the other hand, in transglycosylation the carbohydrate moiety released from the substrate is transferred to the hydroxyl groups of various compounds instead of water. The transglycosylation activity of exoglycosidase is used for enzymatic synthesis of various oligosaccharides, but few endoglycosidases have been studied for the activity. This activity of endoglycosidase might be useful in transferring and adding sugar chain released from glycoconjugates to various compounds having a hydroxyl group, i.e., the activity can be used as a means of glycosylation in which a sugar chain can be added to any compound. We attempted to utilize the transglycosylation activity of Endo-M to synthesize various medicines. Endo-M acts on the linkage between oligosaccharide and protein of various glycoproteins by hydrolysis activity. Moreover, Endo-M can add the oligosaccharide of a substrate to GlcNAc or GlcNAc bound to asparagine residue by its transglycosylation activity. This means that when GlcNAc is bound to the asparagine residue of a protein or peptide the addition of a sugar chain to the GlcNAc moiety is made possible by the transglycosylation activity of Endo-M, leading to the synthesis of glycoproteins and glycopeptides. When the sugar chain is added to a protein or peptide, the resulting glycoprotein or glycopeptide becomes more stable against digestion by protease and peptidase than native proteins or peptides without sugar chains and may in some cases become endowed with bioactivities. We therefore attempted to prepare bioactive glycopeptides by chemo-enzymatic synthesis using Endo-M. The procedure is shown in Fig. 17. Glycopeptide synthesis starts with the chemical synthesis of glycosylasparagine, a synthetic material for peptide with GlcNAc bound at the asparagine residue. First, Fmoc (9-fluorenylmethyloxycarbonyl)-Nβ-(GlcNAc)-asparagine [Fmoc-(GlcNAc)Asn-OH] was synthesized from 2-acetamido-3,4,6-tri-O-acetyl-2-deoxy-D-glucopyranosyl azide (GlcNAc azide) and Nβ-Fmoc-Asp-α-t-butyl ester in the presence of triethylphosphine. Using Fmoc-(GlcNAc)Asn-OH instead of Fmoc-Asn-OH as the building block, solid-phase synthesis of a [(GlcNAc)Asn]peptide was performed by the Fmoc-method. Then the addition of oligosaccharide to the peptide containing GlcNAc was carried out using the transglycosylation activity of Endo-M and glycopeptide as the sugar chain donor (we used glycopeptides possessing complex type sugar chain from hen yolk or glycopeptides possessing high-mannose type sugar chain from hen egg white), and glycopeptides were obtained. 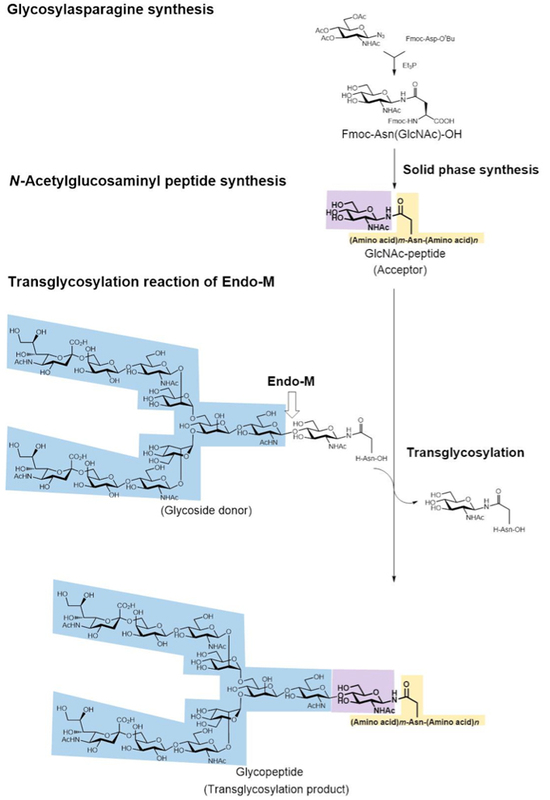 We succeeded in the addition of sugar chain by a one-step reaction using the transglycosylation activity of Endo-M, which involves many steps of enzymatic reactions within cells. We prepared various bioactive glycopeptides by the chemo-enzymatic method described above and succeeded in the preparation of glycosylated calcitonin,8 which is a therapeutic agent used in the treatment of hypocalcemia and osteoporosis, as well as the preparation of glycosylated Peptide T,7 which can block infection of human T-cells by immunodeficiency virus (HIV). Although these glycosylated peptides have been synthesized by attaching a sugar chain at the asparagine residue of peptide, we were able to introduce an N-linked sugar chain to the glutamine residue of the peptide by the chemo-enzymatic method. We succeeded in adding a sugar chain at the glutamine residue of Substance P,9 which has no asparagine residue but does have glutamine residue. Substance P has been reported to be a bioactive peptide of hypotensive drugs and putative neurotransmitters, i.e., it is possible to synthesize glycopeptides having an unnatural glutamine-linked sugar chain by this chemo-enzymatic synthesis method. Such glycosylated bioactive peptides showed resistance against peptidase digestion but their bioactivity was slightly lower than that of native peptide. The decrease is thought to occur due to steric hindrance of the glycosylated peptide since its affinity for the receptor decreases upon the addition of a large sugar chain. However, this decrease is not significant and sufficient bioactivity can be achieved by increasing the concentration of peptide added. In ER of eukaryotic cells, N-glycosylated sugar chain binds to the asparagine residue of consensus sequence triplet Asn-Xaa-Thr/Ser of protein synthesized in ribosome. However, using this chemo-enzymatic method involving transglycosylation of Endo-M, a sugar chain can be attached to any peptide including asparagine or glutamine residue. This is the most important advantage of this chemo-enzymatic method for glycopeptides synthesis. Endo-M has the potential to be utilized for “remodeling” sugar chains to obtain sugar chains having various biological functions. Endo-M can change a high-mannose sugar chain (a simple sugar chain composed of mannose oligomers) on glycoprotein to a complex sugar chain (complex sugar chain composed of various saccharides) on human and animal glycoproteins by its broad substrate specificity of transglycosylation activity10. This suggests that specific and large mannose oligomers bound to recombinant glycoproteins that are produced by recombinant methanolitic yeast using gene engineering technique can be changed to human-compatible complex sugar chains. We have succeeded in remodeling the high-mannose sugar chain on human immunoglobulin (IgG) glycoprotein produced by the recombinant methanolic yeast Ogataea minuta to a human-compatible complex sugar chain. The process is started by the action of Endo-H on the recombinant human IgG expressed by yeast to delete the sugar chain. Endo-H is an endoglycosidase which acts specifically on the high-mannose sugar chain. After IgG with GlcNAc was obtained, the complex sugar chain was transferred and added from glycopeptide of hen egg yolk as donor of sugar chain by the transglycosylation activity of Endo-M to obtain human-compatible IgG. This result presents the possibility of a method for the preparation of large amounts of human-compatible biomedicines produced by yeast. The method may be adapted for various biomedicines including erythropoietin, which at present is produced by CHO cells. Due to the inherent hydrolysis activity of Endo-M, the product yield of its transglycosylation activity is low because it must be hydrolyzed. This problem might be solved by developing a mutant of Endo-M that lacks hydrolysis activity toward the product but enhances transglycosylation activity. We found that the enzymatic reaction of Endo-M proceeds by a unique reaction mechanism called a “substrate-assisted mechanism”11. In general, the catalytic reactions of most glycosidases proceed through two acidic amino acid residues that function as acid-base catalytic residue and nucleophile residue. On the other hand, the enzymes acting by a substrate-assisted mechanism has only acid-base catalytic residue and the 2-acetoamide residue of the substrate with GlcNAc functions as a nucleophile. Chitinases and β-hexosaminidases whose substrates contain GlcNAc are assumed to catalyze hydrolysis and transglycosylation via an oxazolium ion intermediate by a substrate-assisted catalytic mechanism (Fig. 2) different from the reaction mechanism of general glycosidases that form a sugar-enzyme protein complex as an intermediate. The oxazolium ion intermediate proceeds to form a hydrolysis or transglycosylation product by binding to the water activated by a catalytic base-residue or by binding to the receptor, respectively. The above mentioned β-hexosaminidases and their homologue enzymes that belong to Glycoside Hydrolase (GH) family 20 have been reported to possess a conserved aspartate residue located one amino acid residue upstream of the catalytic site of glutamate residue12. This assists in the appropriate orientation of the 2-acetamide group for catalysis and can stabilize the transition state flanking the oxazolinium ion intermediate. On the other hand, GH family 85 enzymes, including Endo-M and its homologue enzymes, highly conserve asparagine residue, not aspartate residue, located two amino acid residues upstream of the catalytic site of glutamate residue13. We hypothesized that this asparagine residue at the 175th residue from N-terminal might play the same role as the corresponding aspartate residue in GH family 20 enzymes. We prepared various Endo-M mutants replacing asparagine residue with other amino acid residues, and carried out the transglycosylation reaction using these Endo-M mutants and synthetic sugar oxazolines as donor substrate (Fig. 2). As a result, the Endo-M-N175Q mutant enzyme with glutamine residue replacing the asparagine residue at the 175th residue showed an extraordinarily high yield of transglycosylation product with repression of the hydrolysis activity14. The N175Q mutant enzyme was able to catalyze a highly efficient transglycosylation reaction using both sugar oxazolines of high-mannose type and complex type as donor of sugar chain. Thus, using a sugar oxazoline as the donor substrate, N175Q mutant enzyme acted as “glycosynthase” for transglycosylation, allowing accumulation of product without hydrolysis15. Furthermore, this mutant enzyme can produce the transglycosylation product using not only sugar oxazoline but also native sugar chain as the donor substrate. We succeeded to effectively change the sugar chain of recombinant human IgG expressed by yeast to human-compatible sugar chain using sialo-complex type sugar oxazoline as donor substrate, giving rise to the possibility of the preparation of large amounts of recombinant antibody drugs compatible to human. It is known that human influenza viruses infect host cells through the binding of viral hemagglutinin glycoproteins to sialic acid of sugar chains of glycoproteins or glycolipids as receptors on the host cell surface16. The infected viruses self-replicate inside the host cells and are then released from the cells by the action of their own sialidase that hydrolyzes sialic acid on the cell surface. At present oseltamivir is widely used as medicine for flu and is effective for inhibiting the sialidase activity of influenza viruses. Although this medicine is effective in shutting viruses inside the cell to prevent the spread of infection to another cell, it cannot directly prevent infection of the original cell. There is great demand for an inhibitor of influenza virus infection, one that directly interferes with the binding of virus hemagglutinin to sialic acid of sugar chain in host cells. We have synthesized glycopolymers carrying sialo-oligosaccharides clustered on a chitosan backbone consisting of poly-glucosamine as a human influenza virus-binding inhibitor17. First we transferred a sialo-complex oligosaccharide of glycopeptides from hen egg yolk to p-formylphenyl β-GlcNAc using the transglycosylation activity of Endo-M followed by reductive amination of the p-formylphenyl sialo-oligosaccharide with the chitosan backbone, and a glycopolymer was obtained. This glycopolymer carried multivalent sialo-oligosaccharides clustered on a chitosan to a degree of substrate (DS) of about 16%. Inhibition of A-type influenza virus infection exceeded 90%. Most biomedicines are composed almost entirely of glycoproteins, and their sugar chains are very important for effectiveness and stability, making the addition and alteration of sugar chains using biotechnological techniques an important subject of study. In future, careful attention must be paid to the heterogeneity of sugar chains to improve the quality and productivity of generic medicines known as biosimilars. The production of biosimilars of consistently high quality and effectiveness is required. To accomplish this it is essential to develop synthetic methods to produce biomedicines using the transglycosylation activity of Endo-M. The need for Endo-M will increase significantly, and the development of enzymes possessing more effective transglycosylation activity is required.